Lakers/Suns Play Game of the Year!! It took three hours, three overtimes and 139 points, but the Los Angeles Lakers got a hard fought win against the Phoenix Suns. And in the process they gave us the Game of the Year. I have watched a lot of games this year and not one of them came close to this one. This game had everything. From a blown 20 point lead to clutch 3 pointers by Channing Frye to Kobe hitting big shots and Ron Artest dunking on an improbable breakaway and kissing his biceps in celebration. If you didn’t like this game then you just don’t like basketball. The Suns came back from a 20 point second half deficit to tie the game at the end of regulation. Watching the Lakers blow another big lead like that reminded me of the old Lakers. The Lakers that would continually take games off. Even in the playoffs. The Lakers that would get bored and the only way they could get any excitement was to let every team back into that game and try to pull out a win in the last seconds. The first overtime ended with a very questionable shooting foul on Lamar Odom. Channing Frye makes all three freethrows to send the game into its second OT. Frye hits another three near the end of the second OT to put the Suns up with 50 seconds left. Then Pau Gasol gets fouled but doesn’t get a pretty obvious goaltending call in his favor. But he does hit two freethrows with two seconds left to tie the game. 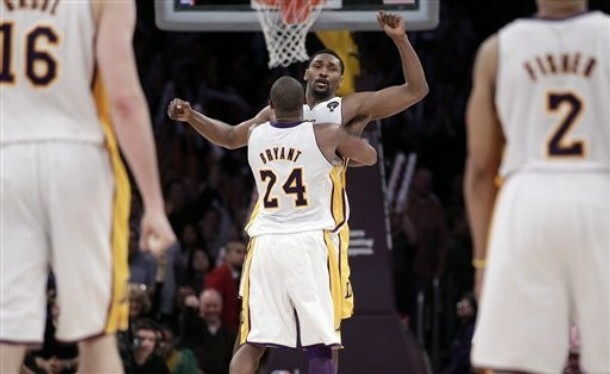 Ron Artest came up big in the third OT, scoring five of his 18 points in the last two minutes. Its always good to see Ron Ron do well. Not only because the Lakers usually win when he plays well but because his post game interviews are always so great. Kobe Bryant had a season high 42 points and almost messed around and had a triple double with 12 rebounds and 9 assists. I’m sure the Lakers will be happy to get Andrew Bynum back so he can play some defense and they won’t have to score 139 points to win the next game. The Lakers are a very impressive 14-1 since the All-Star break and seem to be peaking at the right time. It remains to be seen if they will win another championship but the seem to be on the right track.